May 24, 2013 is a very exciting time and a staple for new inventors and engineers who have spent many years making solar transportation vehicles such as; long distance boats, airplanes and other types of transportation vehicles that can go great distances. The first thoughts of solar transportation surprisingly enough dates all the way back to 1838 by Edmund Becquerel who experimented, observed and published findings about the nature of materials to turn light into energy, but were not pursued. A solar airplane that inventors hoped to eventually pilot around the globe landed safely on Thursday in Texas, completing the second and longest attempt to fly across the United States powered only by the sun. The superbly designed experimental aircraft, named “Solar Impulse”, touched down at Dallas/Forth Worth International Airport shortly after 1 a.m. Central Standard Time, logged 18 hours and 21 minutes in the air to cover 823 nautical miles from Phoenix, Arizona. 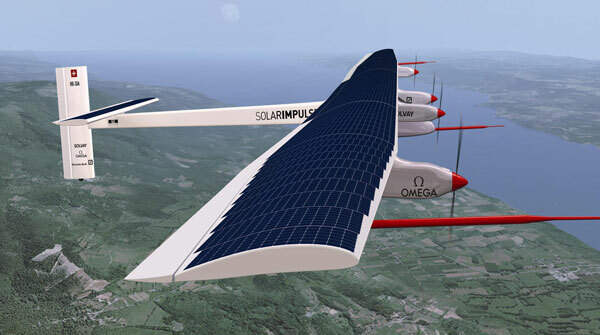 The flight set a new world distance record in solar aviation. Solar Impulse, which flies at 43 miles per hour (69 km per hour), began its cross-country sojourn on May 3 with an 18-hour-plus flight from northern California to Phoenix. 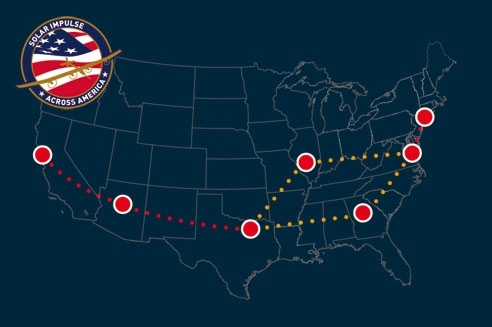 “Solar Impulse” made additional stops in St. Louis and Washington, D.C., having layovers at each destination waiting for favorable weather, the flight team plans to continue the plane’s voyage at New York’s John F. Kennedy International Airport in early July. Swiss pilots Bertrand Piccard and Andre Borschberg, the co-founders of the project, are taking turns flying the plane, which has a single-seat cockpit. Piccard piloted the first leg from California to Arizona, and Borschberg flew the second stretch to Texas. “This travel length was particularly challenging because of strong winds when landing, said pilot” Borschberg in a statement released after the flight. Andre has already held the record for the longest-duration flight in a solar-powered plane – 26 hours. The Solar Impulse project began in 2003 with a 10-year budget of 90 million euros ($112 million) which involved engineers from Swiss escalator maker Schindler and research aid from Belgian chemicals group Solvay. Solvay was one of the first investors that wanted to test new materials and technologies while also gaining brand recognition. 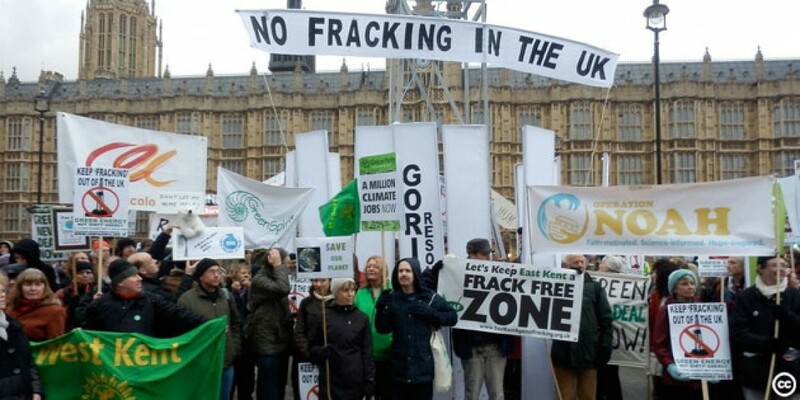 Project organizers say that the journey was also intended to increase worldwide support and recognition for the adoption of clean-energy technologies. The wingspan of this miraculous jumbo jet, is surprisingly the same weight as a small car. “The Solar Impulse” is just a test model for a more advanced aircraft the team plans to build to circumnavigate the globe in 2015. The plane made its first intercontinental flight, from Spain to Morocco, last June. 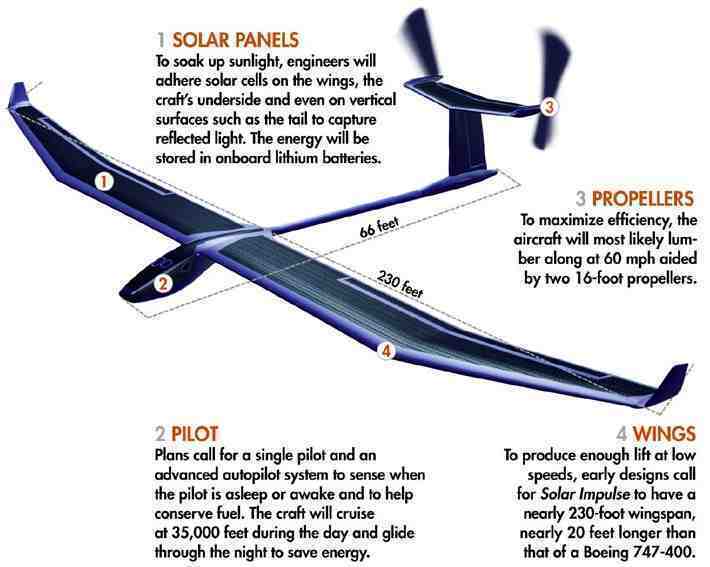 The aircraft runs on the same power as a motor scooter, propelled by energy collected from 12,000 solar cells built into the wings that simultaneously recharge batteries with a storage capacity equivalent to an electric car. In that way, the Solar Impulse can fly after dark on solar energy generated during daylight hours. It is the first solar-powered aircraft capable of operating day and night without fuel to attempt a U.S. coast-to-coast flight. Currently Solar Impulse is unlikely to set any speed record, nor is it unlikely to set any altitude record, but Solar Impulse can gradually climb to altitudes of 28,000 feet. The current solar model was designed for flights of up to 24 hours, but the next model is in the works. and will have to allow for up to five days and five nights of flying by one pilot – a feat never yet accomplished. Deep meditation and hypnosis therapies are apart of the pilots’ training to prepare them to fly for extremely long hours without sleep. There is no autopilot mechanism as of yet. The plane’s four large batteries, attached to the bottom of the wings along with the aircraft’s four propellers, account for a quarter of its overall. The lightweight carbon fiber design and wingspan allow the plane to conserve energy, but also make it vulnerable to being tipped over. The next model should eliminate some of these inconveniences and hazardous interludes as the awkwardness of the balancing of the fiber design. A ground team of weather specialists, air traffic controllers and engineers track the plane’s speed and battery levels and help the pilot steer clear of turbulence. Solar Impulse cannot fly in strong wind, fog, rain or clouds. Its machinery is not designed to withstand moisture, but with any new invention, much tweaking will be need in order to find the missing links, to make a better, stronger and more durable plane that can withstand the elements of weather. Categories: Solar Impulse Project 2013 | Tags: 112 million, 90 Million Euros, Altitude Record, Aviation, Central Standard Time, Cross Country, Cross Country Flights, Flight, Nautical, New Solar Airplane, New Yorks John F Kennedy Airport, Phoenix Arizona, Record Speed, Solar Impulse, Solar Transportation, St Louis, Texas, Washington DC, wingspan | Permalink.